Dalton Gang corpses photo op, created by artist Don Sprague in 1992. Not every town has a giant twine ball or settlers massacre site on which to peg its civic pride. Some must make the best of what fate has handed them, and few have grabbed their opportunity with such gusto as Coffeyville, Kansas, whose citizens killed some bank robbers over a hundred years ago and have been pocketing interest from it ever since. The robbers were members of the Dalton Gang, America's premier lawbreaking family of the Gilded Age. One of their hideouts is preserved in Meade, but the true lover of Dalton Gang lore takes a trip east, cross state, to Coffeyville, where two of the Dalton brothers (and two of their henchmen) were shot dead on October 5, 1892. 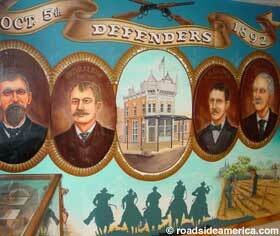 A map mural over the Isham Hardware parking lot helps visitors trace the bloody path of October 5, 1892. At first, Coffeyville was content to contain its civic chest-thumping to the Dalton Defenders Museum, an oddly-named nod to the martyred heroes of the day. It exhibits a collection of artifacts, old photos, and a horse-drawn hearse (the type used "to carry the Dalton bodies to their graves"). The place has a wall-size photo of the Dalton Gang's corpses, and visitors can walk across the actual threshold and through the actual vault doorway of the two banks that the gang robbed just before an irate citizenry blew their brains out. But Coffeyville has broadened its horizons, taking its carnage out of the display cases and putting it back onto the streets where it belongs. Many towns offer self-guided walking tours of historic homes; Coffeyville encourages tourists to visit every spot where a body fell. The principal venue for this one-of-a-kind tour is "Death Alley," where painted outlines on the pavement mark the bad guys' bodies, plaques mark the final resting places of the good guys, and every bullet hole in the walls is flagged with a helpful sign. The restored Coffeyville City Jail is here as well. A picture window in the wall lets you see four showroom dummies dressed as the Dalton Gang's corpses -- just like the wall-size photo in the museum. Fifty cents in a coin box gets you a recorded narration that tells you the history of the big day. It goes on, and on, and on, and will still be echoing down the alley as you leave. Recognizing the value of a powerful icon, the Dalton Gang corpses image is reproduced again, this time as a life-size mural painted for the 100th anniversary onto the sidewalk outside one of the banks. 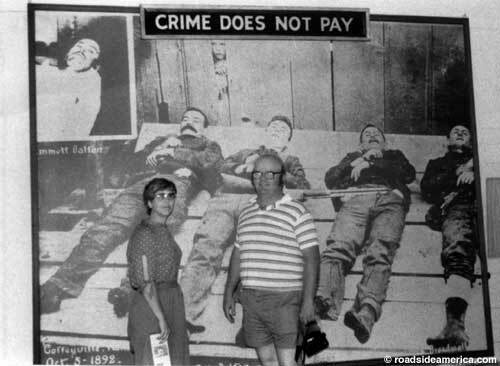 It is a unique photo-op, allowing you, the 21st century tourist, to lie atop a 19th century bank robber and pretend to be dead. And, perhaps echoing the "hail of bullets" theme, the Dalton Defenders Museum has another unique and -- potentially, at least -- deadly display: a plaster replica of the "largest hailstone on record," 17.5 inches in circumference, 1.67 pounds. It fell on Coffeyville on September 3, 1970, roughly a century after the Dalton carnage. "Scientists concluded that it struck the ground at a rate of speed of about 105 mph." Wouldn't that have smashed it into smaller hailstones? Or maybe the 1.67-pounder is a smaller hailstone. In July 2010 the Coffeyville hailstone was finally surpassed in size by one that fell in Vivian, Nebraska, with an 18.625-inch circumference and a weight of 1.93 pounds. But you can't see that hailstone in a museum, let alone a museum as memorable as the one in Coffeyville. Downtown, at the corner of 8th and Patterson. Just west of S. Walnut St., between E. 8th and 9th Sts. The Dead Zone, Coffeyville, KS - < 1 mi. Dalton Gang Grave, Coffeyville, KS - < 1 mi. Monkey Island, Home of America's First Space Monkey, Independence, KS - 15 mi. Kong Korner and Kongs Kafe Gorilla, Claremore - Foyil, OK - 44 mi.